The spatial command line tool includes a set of tools for managing and developing SpatialOS projects. There are two categories of commands available via the spatial command line tool: those which are specific to a particular project, and those which are not project-specific. These commands are specific to a particular project. You must run them from within a SpatialOS project directory. These commands are not specific to a particular project. You don’t need to run them from within a SpatialOS project directory. 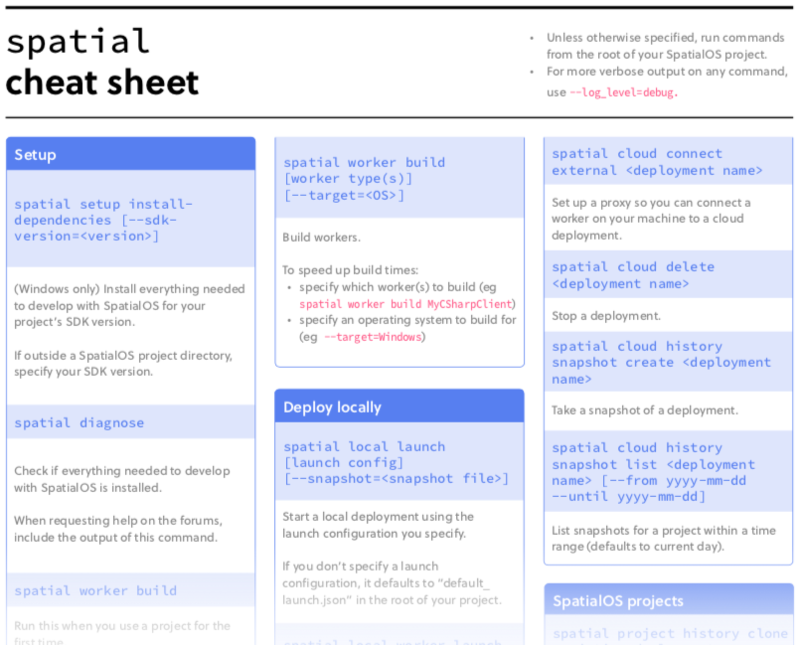 For a quick reference to the commands, see the spatial cheat sheet (preview below). For full reference documentation, see the spatial documentation. spatial outputs information to two places: to the console and to logs/spatial_<date_time>.log. The log files (for example logs/spatial_<date_time>.log) show information messages, warnings, errors, and additional debugging information. They’ll always contain all this information, regardless of the --log_level value you use in the console. Each file contains all the logs for a given spatial invocation. We keep the 20 most recent log files. Authorisation: Checking that users are using the platform from authorised accounts. This is the step that opens a web page. Once checked, authorisation lasts for a few hours. Updates: Checking for updates to the underlying infrastructure, which is responsible for starting and running local deployments. These updates are separate from the SDK version (specified in spatialos.json). Currently, the build will fail if this can’t complete. Logging: Logging to help us understand how people are using the platform. This is done in the background while the task is running, and won’t stop the task completing. You can use spatial worker build and spatial local launch offline. This means you can iterate on local projects without needing an internet connection. Make sure you have the latest version of the spatial CLI by running spatial update from the command line. Once you’ve done this, you’ll be able to work offline regardless of your SpatialOS SDK version. Run spatial worker build and spatial local launch (while online) for each project that you want to work on offline. This makes sure you have all the required dependencies before going offline. You’ll need to repeat this if you change your SpatialOS SDK version, or if you update your launch configuration file. You should now be able to run spatial worker build and spatial local launch offline.